Created by an in-house team of motors experts the patented V9 Dyson digital motor powers the Dyson Airwrap™ styler. Partnered with Dyson’s unique styling barrels this motor enables the Dyson Airwrap™ styler to style with air, without the need for extreme heat. As the motor spins an area of high pressure occurs at the top of the styling barrel. This pressure creates a high velocity jet of air dispersed out of six air slots around the barrel. This generates a physical phenomenon known as the Coanda effect. 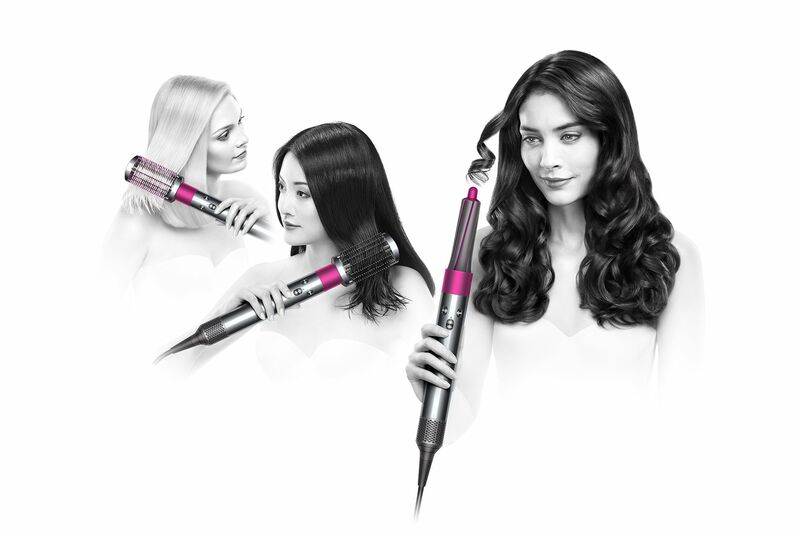 This allows the hair to curl automatically around the barrel to style. Dyson engineers always start with the problem. The engineering team set out to invent a styling device capable of achieving great hair styles, and a variety of them, on their own – with one easy-to-use tool. At the heart of this story comes a radical idea: use Dyson’s fast, high-pressure digital V9 motor to harness a phenomenon known as the Coanda effect. The Coanda effect occurs when a high-speed jet of air flows next to a surface and, due to differences in pressure caused by the surface, the air flow attaches itself to the surface. Taking advantage of this principle Dyson’s team of aerodynamicists created a way to style hair using only air combined with heat. The result, whether you choose to curl, wave, smooth or rough dry your hair, creates a natural look with a sleek finish, helping prevent extreme heat damage. “We have been obsessively manipulating airflow for more than 25 years. It is one of our core areas of expertise. Harnessing the power of Dyson’s digital motor we have engineered a truly unique styling tool preventing extreme heat damage when styling. I’m immensely proud of what our engineers have achieved.” James Dyson, Founder & Inventor. In addition to testing and researching hair, Dyson engineering teams researched current styling technologies and identified what they feel to be issues with those offerings. Some tangle hair. Others reach extreme temperatures. They can be bulky, or have weak and unruly airflow. Some take patience and time. Some require a great deal of skill to achieve good style. The Dyson Airwrap™ styler looks to solve these issues by creating voluminous curls, waves or a smooth, straighter style with ease. Curl, wave, smooth, and dry your hair without extreme heat. The Dyson Airwrap is officially in Manila starting October 26 exclusively at Dyson Demo stores in Greenbelt 5, SM Aura Premier, and The Podium.